When we think of the American West, we tend to conjure up images that are known the world over: bearded forty-niners leading pack mules up a mountain trail, the Oklahoma land stampede, Custer's Last Stand, and especially the range-riding, quick-shooting cowboy. But these familiar images are only a small part of western history. From the arrival of the Navajos in the Southwest more than seven hundred years ago, to the first Spanish settlements in New Mexico in the late sixteenth century, to the large Mormon migration to the Great Salt Lake, to the tourists flocking to the neon landscape of modern Las Vegas, the complex story of the West stretches across centuries, embracing many voices and contrasting cultures. The West is in fact as varied as America itself. Indeed, to enlarge on Wallace Stegner's singular phrase, the West is America, only more so. 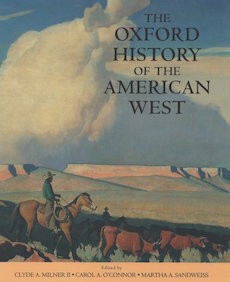 Lavishly illustrated and based on the finest scholarship, The Oxford History of the American West is the first comprehensive study to do full justice to the rich complexity of this region. It brings together the work of twenty-eight leading western historians who explore this area from a dazzling number of perspectives. They provide insightful portraits of the West as a distinctive place of varied peoples--native and non-native, European and Asian, African and Latino--and of varied terrain--from the timbered Pacific Northwest to the Dakota Badlands, and from the fires of Kilauea to the ice cliffs of Glacier Bay, Alaska. They describe the great wealth generated by a series of spectacular bonanzas, such as gold at Sutter's Mill, copper in Butte, Montana, and oil on Alaska's north shore; illuminate the role of the West in the national and global economy; and consider the environmental challenges created by replacing buffalo with cattle or by designating national parks and military test sites. The book also examines the social forces behind the violence of the West, the great political movements that affected the region (most notably, the Populist Party), and the importance of families in settling the West (for instance, tracing one family's westward migration over 150 years). The authors provide important insights about many longstanding controversies, and they offer not only the fruits of the latest thinking about the West, but also a vivid sense of how people actually lived. For instance, we read of pioneers who grated green corn to make pudding they flavored with berries and grasshoppers, and who ate the culms (the soft inner linings of the stalks) like asparagus. Finally, each chapter concludes with an extensive annotated bibliography, offering a full review of related material, and there is a comprehensive index to guide readers to topcis of special interest. Ranging from a thoughtful analysis of John Ford's classic My Darling Clementine, and a survey of Western art and literature (including figures as diverse as Francis Parkman, Frederic Remington, Willa Cather, Georgia O'Keeffe, and N. Scott Momaday) to a careful consideration of recent events, such as the Los Angeles riots of 1992 and a revisionist look at cattle grandee Granville Stuart (once Montana's most revered pioneer), this lively, authoritative volume continually challenges the familiar as it broadens the reader's understanding of a vast and varied region.